Attention Pacific West Coasters: Want to visit a beautiful sheep farm? (No, not this one.) My shepherdgirl pal (and amazing artist) Katherine Dunn and her husband are holding a very special Father's Day Open Farm Weekend at their farm outside Portland, Oregon in the heart of the beautiful wine country. Sheep, lambs, goats, dogs, pony rides, 4500 lavender plants, farm art and other fun stuff for sale, and more. Click here for details, and click here to visit Katherine's Apifera Farm blog. A year of Daily Photos ago: Nero Di Toscana Cabbage (which is thriving in this year's garden and tastes wonderful in freshly picked salads). Oh jeez, you have mulberries too? Next you're gong to tell us you're raising silkworms! Well, I did guess berries.... but not mulberries... mmmm mmmm good. Anyway - have a great day.. how are the llamas?? I guessed wild berries, though not mulberries. Great pictures every day, Farmgirl. Thanks. totally mulberries, used to pick those when i was little. Mulberries and morning glories are the enemies in our community garden! they sprout up weeds everywhere! they are tasty though. ..
what's the difference between a mulberry, a boysenberry, a tayberry, a loganberry and a gooseberry ? I am a gooseberry cos I don't know the answer. Mulberries. 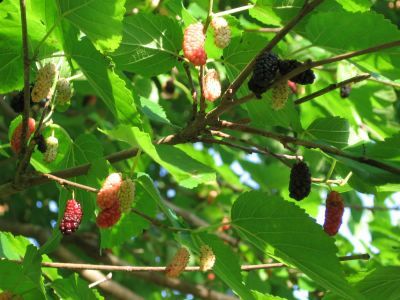 :) Ordinarily I wouldn't mention my new food blog in comments (I generally consider that spam), but my inaugural post happened to be about mulberries so I hope you don't mind. Love reading your blog and living vicariously through you, since I'm too lazy to do all that work myself, lol. There are quite a lot of weeping mulberry trees in Pittsburgh. these are not only decorative, but very convenient for picking, as they are short. There's a big full-size mulberry on my way home from work by my bus stop, just about ready for my annual pilfering venture. ( my excuse:The people never pick them, they are otherwise birdfood, and I leave plenty for the birds near the top. )Mulberries make a lovely, delicate ice cream. It is conveniently located by the linden tree where I pick the neglected flowers for linden tea. These are some of the very few good reasons for carrying a briefcase. You can always tell when the birds are eating mulberries!!! That would be a mulberry! I don't know if I've ever had a mulberry. I do remember watching silkworms spin silk in elementary school and feeding them mulberry leaves, but that was a very long time ago. LOL! What do mulberries taste like? Blackberries? Raspberries? I love all berries so I'm sure I would love them. I was going to guess mulberries, but I don't know that I've ever seen them in person. I've just discovered your site, and I love it! My first thought were mulberries.. and it looks like a lot of other people thought so too, well I guess we wil find out soon..
Mulberries! Yep, ours are grtting ripe too! Last year we had berries tht looked good but were a bit too watery/tasteless. Hope we have better this year. I love mulberries. Growing up on a farm, I had this tree I visited daily. Of course mom loved it when I came in with purple fingers and stains on my clothes. And not a tree you wanted to park under. Farmgirl - CONGRATULATIONS - when i logged into blogger this morning i saw you are their "blogger of note" today. My grandparents had a mulberry tree on their land in Philadelphia, MS. The remnants of Katrina took care of it though. I miss climbing over the wooden fence for a little snack. Could you tell me if there is mulberries and blackberries are the same? Because I always thought so, but here in France we have blackberries (mûres) by the hundred, and they don't grow on trees, but on a rampant plant (actually they are considered as weeds, except by children) and everyone here is talking about trees. But then my dictionnary tells me blackberry=mûre, and mulberry=mûre. Yep, they're mulberries, and they are absolutely delicious! Love all your mulberry stories--thanks for sharing them. No silkworms, but after reading the wikipedia info (see link on post) on mulberries, I at least now know what you're talking about, LOL. Enjoyed your mulberry post--what a coincidence. And congratulations on your new food blog! What do mulberries taste like? Hmmmm. Good question. Ours are very sweet, but apparently all of the varieties are not sweet. When I eat them, no other berry immediately comes to mind, as in "this tastes like a _____berry." I guess sort of a cross between a very sweet blackberry and maybe a raspberry, but with a different texture. Lots of seeds in them. This should help clear up your berry confusion somewhat. Click here. 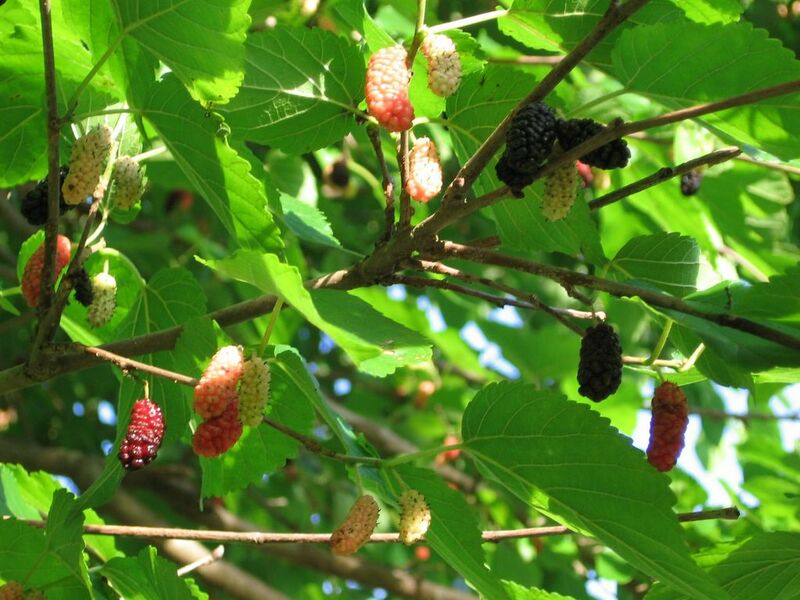 And for more info on mulberries, see the link in this post where it says to click to "learn more than you ever wanted to know about mulberries." Apple--mulberries do indeed grow on trees, and blackberries are brambles. I don't know why they have the same translation in your dictionary. Definitely confusing! Also, Sam, see the above link for a photo of gooseberries posted on my kitchen garden site. Now in its tenth successful year, this innovative event is an example of a sustained partnership between Time's Up! and Friends of Brook Park of the South Bronx. This is really a trip on the wild side for a unique view of what is world-renowned as the "South Bronx." A leisurely tour that includes beautiful natural wonders of the waterfront, community gardens and art, and historic places. This season the ride will feature fresh mulberry picking on Randall's Island, bring a recycled container and a thin sheet to catch the berries! On this trip participants of all ages are made aware through actual site visits of polluting fossil fuel power plants and gargantuan waste transfer facilities that litter our rivers' shores. Alternatives to the existing government policies are brought to everyone's attention, with post-ride action steps including promoting demonstrations, letter writing, and email campaigns. TIME'S UP! provides critical outreach and promotion for this ride and early support has led to significant growth in attendance as well as continued support and involvement with the important efforts of Friends of Brook Park by ride participants. that looks great. i remember my chatmate at webdatedotcom telling me to visit their farm in texas. it's quite a number of miles away from me but i'm considering it. it's for father's day as well..
We've got a tree of them in our back yard. When we lived in Oklahoma and camped each July 4, the boys would go out and pick a bunch for their grandma to make a pie. I'm not a big fan of them, but they have memories for the boys. i have a mulberrie tree in my garden, it's weird it grew there, since it's a semi-desertic area. anyhow, the poor thing is old and almost dead, i do hope it will wait for the other 48 babies to grow and start producing the fruit. i really love them, they're so sweet. have you tried them in jam? It may not be the most superb tasting spread, but the taste will evoke the first warm summer days in your mind with every mouthfull. Now, the tricky part is finding a 'good' tree. Each tree has it's own personality - even when growing side by side - the delicacy of flavor and degree of sweetness varies - so taste carefully before you commit you hands (and wrists, elbows and clothing) to a semi-perm. stain from picking. PS - not much relieves the mulberry blush from your fingers - so wear it with pride and hand the raised eyebrow giver a dish of cobbler. It's amazing how many of us have been reminded of our respective childhoods thanks to the mulberry picture you've put up. Me too. Thanks! Mmmm, mulberries. We've got two different trees, one with the big berries like your pic and one with smaller, round berries. Unfortunately, the deer come along and munch from beneath the tree, getting most of the ones I can reach. But I do get the occasional sweet purple-stained handful. One place I lived in San Jose had a huge old cherry tree, ditto fig tree, apple and apricot and orange trees. Yum. Then I moved about half a mile away and had avocados, plums (3 kinds), apricots, loquats, Meyer lemons, oranges, walnuts. I think that's all. And this was on the edge of downtown. Loved that neighborhood and miss its bounty. I just love your blog. I have only discovered blogging (along with your blog) 2 weeks ago and is still a newbie finding my way around blogging. Your pictures of mulberries intriqued me. I have never seen one on a tree before, only on the supermarket shelves. Even then, over here in Malaysia, we have to pay 3 times what you pay over there. Wish i could pluck berries off trees over here. We are kind of tired of mangoes, bananas, papayas or jackfruits.